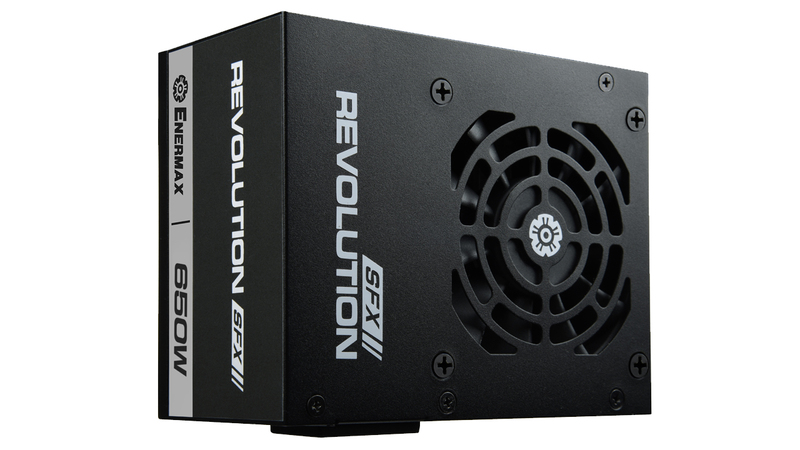 The REVOLUTION SFX power supply series brings Enermax technology to a small form factor. The PSU uses high quality components like Japanese 105°C capacitors and DC-to-DC technology to achieve the 80 PLUS® Gold efficiency. 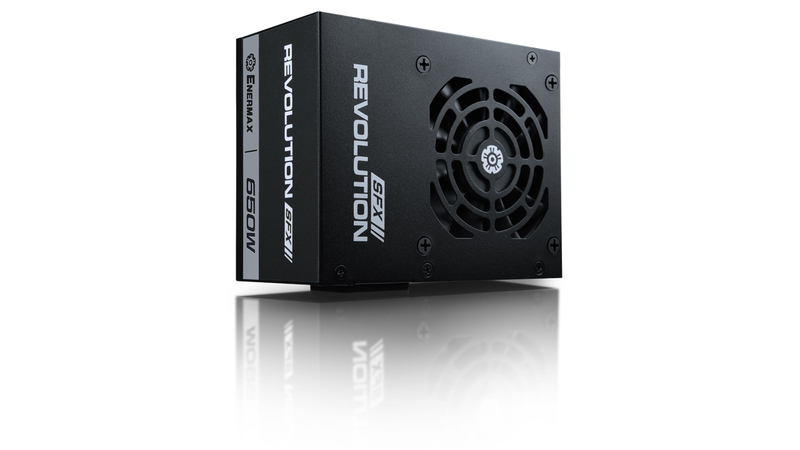 Unlike most other SFX PSU’s the REVOLUTION SFX is available with up to 650W. 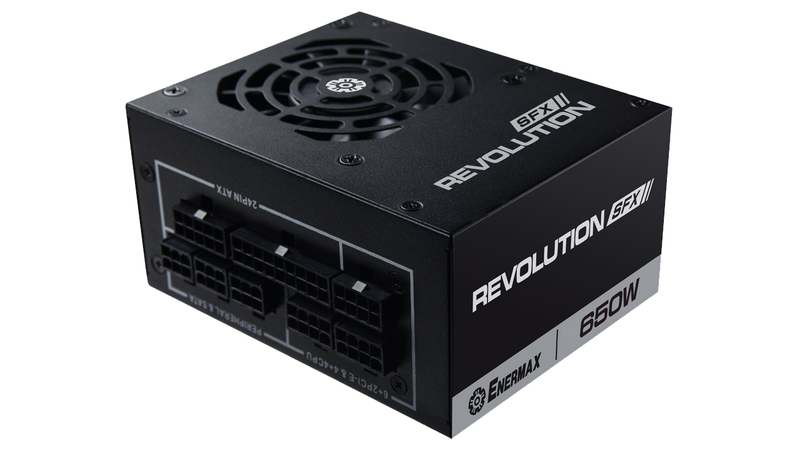 With this wattage it can power even the latest high-end graphics cards making it the best choice for compact gaming systems. Up to 92% efficiency at 230VAC between 20 and 100% load. 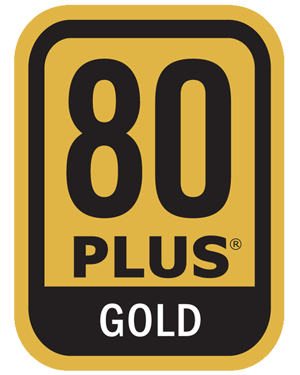 The REVOLUTION SFX series is 80PLUS® Gold certified. REVOLUTION SFX helps systems to meet the EU eco-design directive 2013 ErP Lot 6 and 2014 ErP Lot 3 (< 0.5W in standby mode*) due to a high-efficient 5V standby (+5Vsb) circuitry. Moreover it supports the EU regulation no. 617/2013 demanding amongst others 85% efficiency at 50% load and 82% at 20% and 100% load. The fully modular cable management with flat cables allows an easy system installation and cable routing and improves the air circulation inside the case. Thanks to the smart semi-fanless control REVOLUTION SFX series operates completely silent up to a system load of 30%. 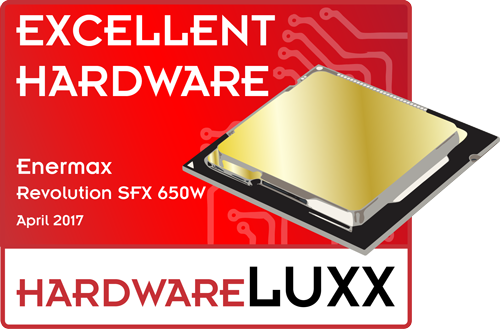 The integrated 8cm Enermax fan with patented Twister Bearing™ technology ensures an efficient and continuously silent cooling and long lifetime with up to 160,000 hours MTBF. 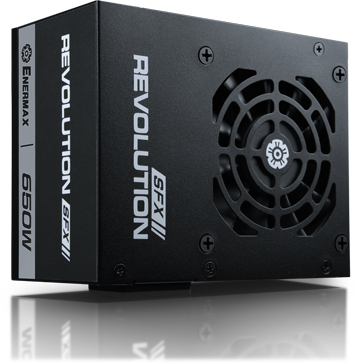 The SFX form factor (100mm depth) makes REVOLUTION SFX the perfect PSU for compact high-performance systems. 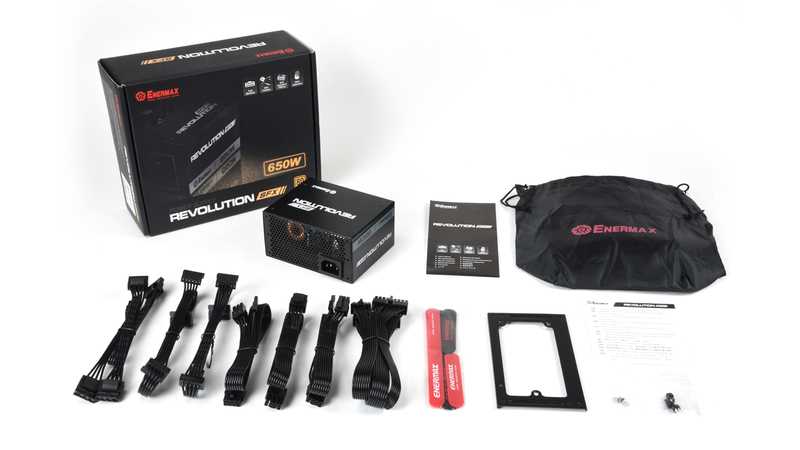 Included with the package comes an ATX-Adaptor to install the PSU in larger cases. 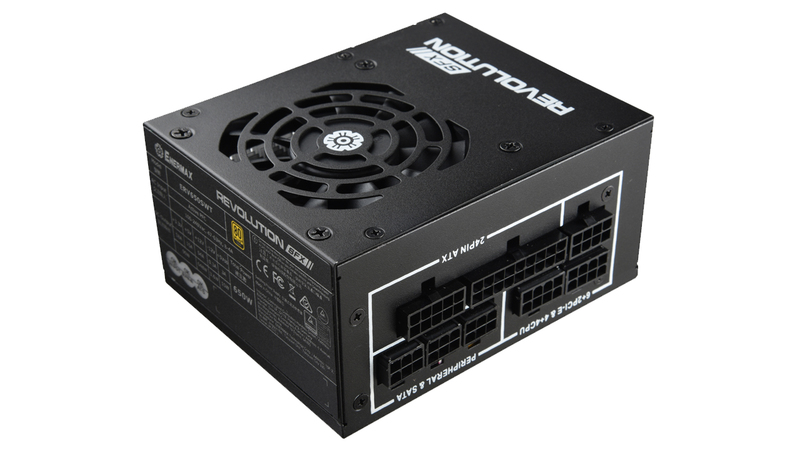 Intel® ATX12V v2.4, compliant with the Intel Power Supply Design Guide for Desktop Platform Form Factors Revision 1.31 April 2013. Worldwide compatibility with automatic 100-240VAC input and up to 0.99 with active Power Factor Correction (PFC). 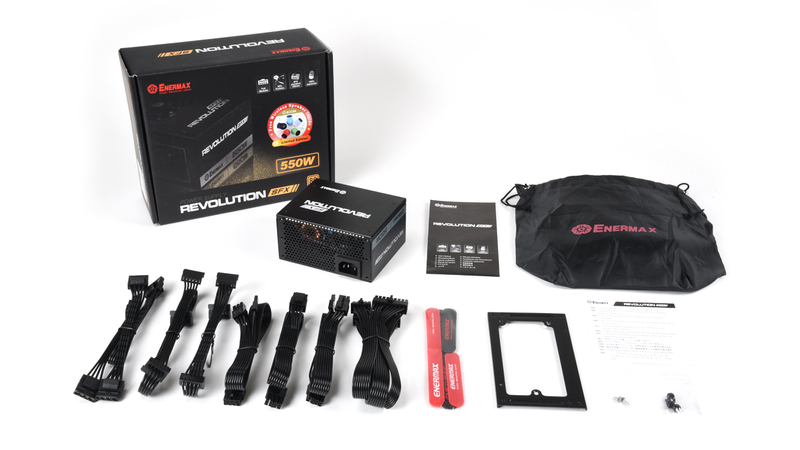 Enermax SafeGuard, multiple protection circuit that keeps the power supply and the system safe from damage by short circuit (SCP), over voltage (OVP), under voltage (UVP), over current (OCP) (5V/ 3.3V), over temperature (OTP), over power (OPP) as well as surges and inrush current (SIP).